Chaz cooks up a whole package of maple flavored bacon for the B&B. 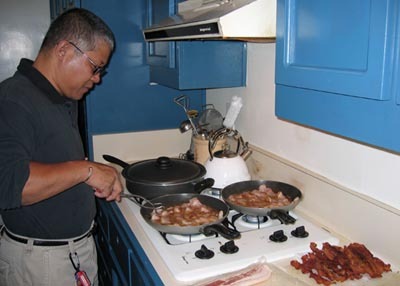 Good stuff, he does it the old fashioned way and makes perfect bacon, no microwaves involved. Here I am with Chaz and Linda about a few hours before my leaving Laguna Beach and Los Angeles. They have a first-class operation there at Eiler’s Inn and it was good to have some aloha spirit on my trip. 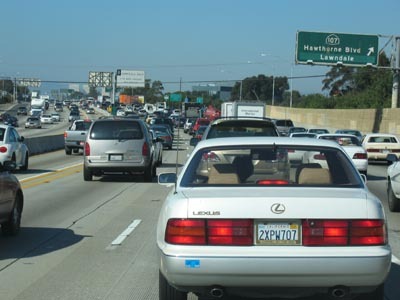 Ah yes, one last trip on the 405 North (I think) to make me miss living in Kona, where we have only one lane of bumper-to-bumper traffic sometimes instead of six lanes of traffic all the time.